Stop whatever you're doing (other than reading this, of course): This recipe is so incredible that it's taken over Hungryland -- we can’t get enough! It's quick and easy to make, and you'll FLIP once you try it. Get on it! Bring a skillet sprayed with nonstick spray to medium-high heat. Add corn, and sprinkle with cumin and chili powder. Cook and stir until blackened, about 4 minutes. Meanwhile, in a small bowl, stir 1 tbsp. feta cheese into avocado. Spread avocado mixture over toast, and sprinkle with salt and pepper. Top with corn, remaining 1 tbsp. feta cheese, and cilantro. 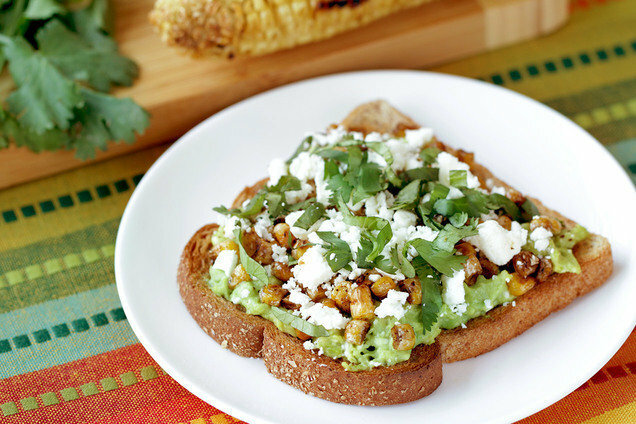 Hungry for More Avocado Toasty Treats? Today, February 9th, it National Bagels and Lox Day. Hold the bagel and make these Smokey Salmon Lettuce Wraps! You need to share this recipe with everyone! Click "Send to a Friend" right now.